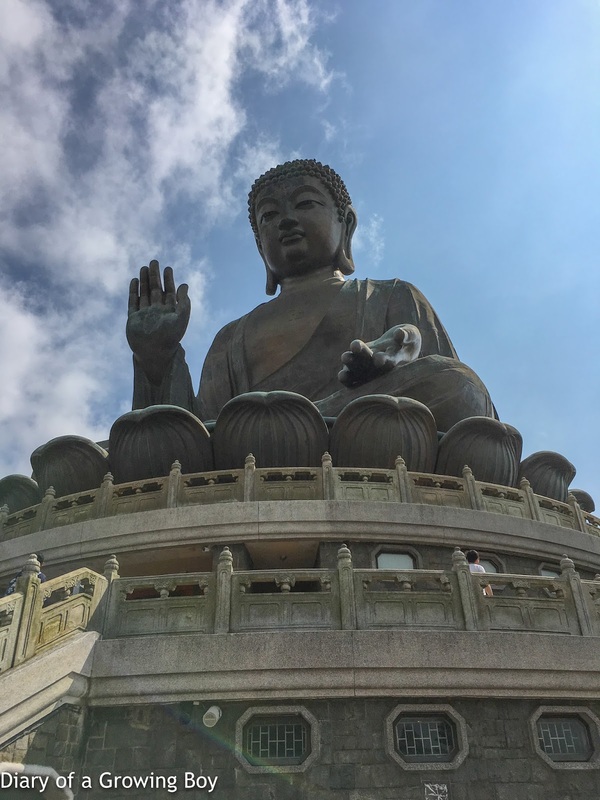 With the weather forecast predicting very fine weather today, I had planned a trip to Lantau Island with Hello Kitty today so I could get more use out of my drone. Somewhere along the line Diva decided that he would like to come along, so I planned out the trip and we agreed on a noon departure. The weather, as it turned out, was fantastic on this Easter Sunday. I knew there would be a ton of people trying to get out of the city, so the lines for buses at Tung Chung would be ridiculous. Ferry to Mui Wo would be a better idea, as the number of people waiting for buses would be limited by the number of passengers that could fit on any single ferry. But first, a little fuel is needed before we embark on our adventure. Hello Kitty and I got our caffeine fix at Fuel in IFC - which now charges HKD 52 for a latte... because they can. 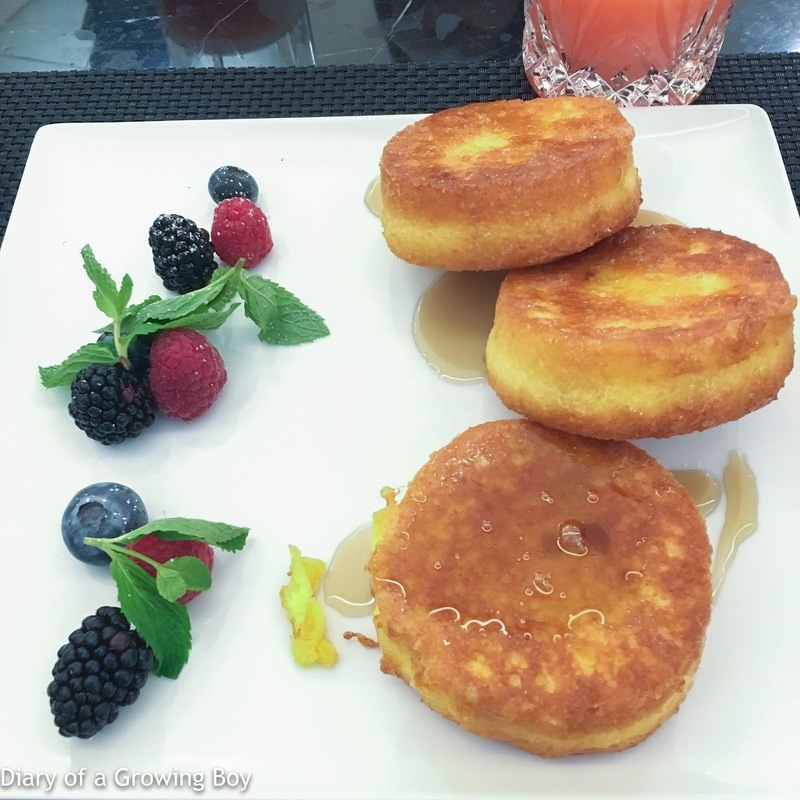 We then decamped to Le Salon de The Joël Robuchon for some breakfast. Why did we make two stops, you ask? Well, there's nothing substantial that we'd wanna eat at Fuel, and the coffee at Oncle Joël's is disgusting. And we wanted the best of both worlds. I ordered the brioche French toast with berries, and since we were gonna burn up some extra energy today, figured I'd add the pork sausages on the side, too. After waiting around 15 minutes or so, my French toast arrived - sans sausages. I was a little annoyed but willing to forgo the encased meat, but the kitchen sent them out a few minutes later. I must say... these were probably the most fancy French toasts I've ever had. Definitely tasty... and I don't wanna know how much butter was used. The pork sausages had a very strong, if pungent, taste to them. I can imagine some of the customers complaining about that. We arrived at the ferry pier 15 minutes before the scheduled departure time and found ourselves at the back of a very, very long queue. I'd never seen anything like it at the pier, and wondered whether we would be able to make it on the 12 p.m. ferry. Well, we did miss the ferry that I wanted to be on, but thankfully there was an extra sailing a short while after, and as luck would have it, we made it just in time for the scheduled bus departure I wanted to catch. After a long and winding journey that took us along South Lantau Road, rounding Shek Pik Reservoir and passing not one but two prisons, we finally arrived at Ngong Ping. Hello Kitty and Diva parked themselves at a restaurant inside the tourist trap known as Ngong Ping village, while I found myself a quiet corner from which to launch my drone. Click here for a 4K version of the video. 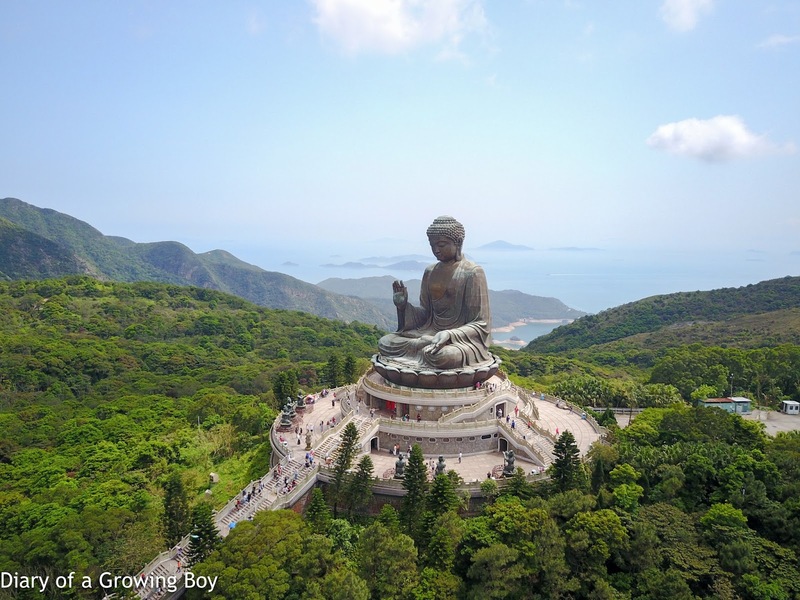 The weather was absolutely beautiful today, and I made two flights around the Tian Tan Buddha (天壇大佛) - circling overhead to get the obligatory 360-degree view with the DJI Mavic Pro's Point of Interest Mode. I also managed to get a glimpse of Tung Chung as well as Hong Kong International Airport in the distance, but I had planned a hike later in the day to get a better view. 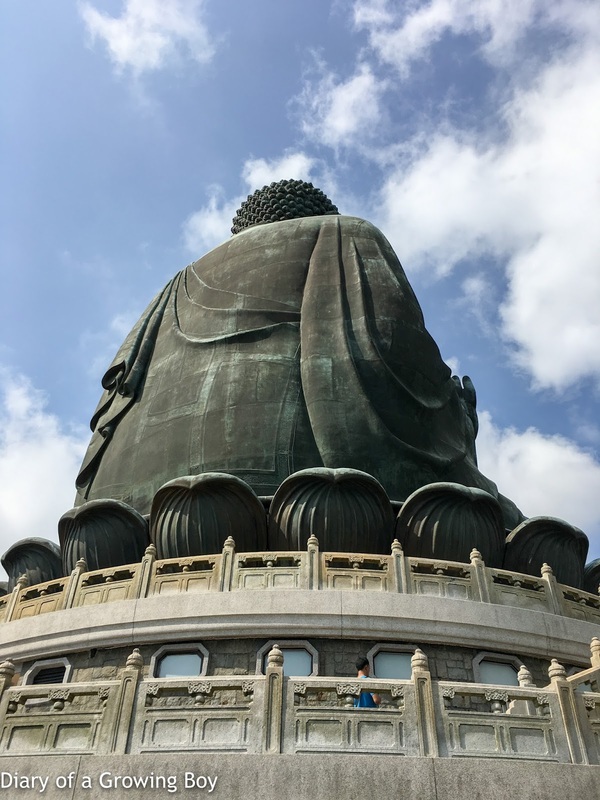 After I finished flying the drone, we went onto the grounds at Po Lin Monastery (寳蓮禪寺) and climbed the steps to the big Buddha statue. It's been 20 years since my first and only visit, but I was very glad to have come back. I guided the drone on an ascent to the top of Lantau Peak, thinking that unlike yesterday, I've got direct line of sight to my target destination... and also no interference. 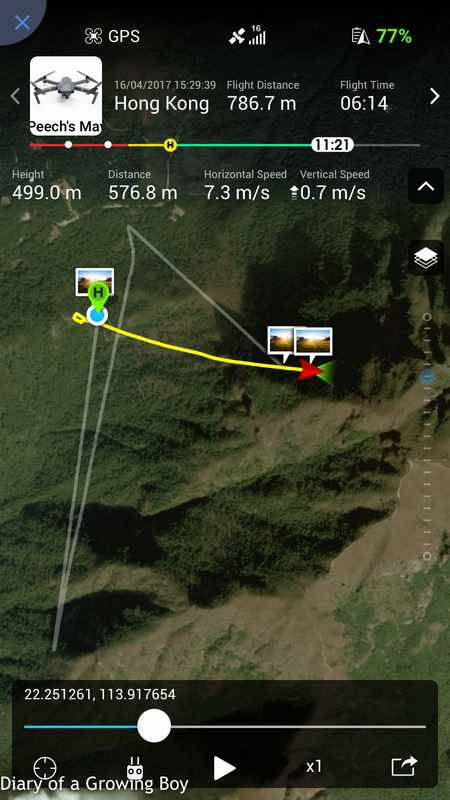 And hey, I was launching the drone at an altitude of around 450m! 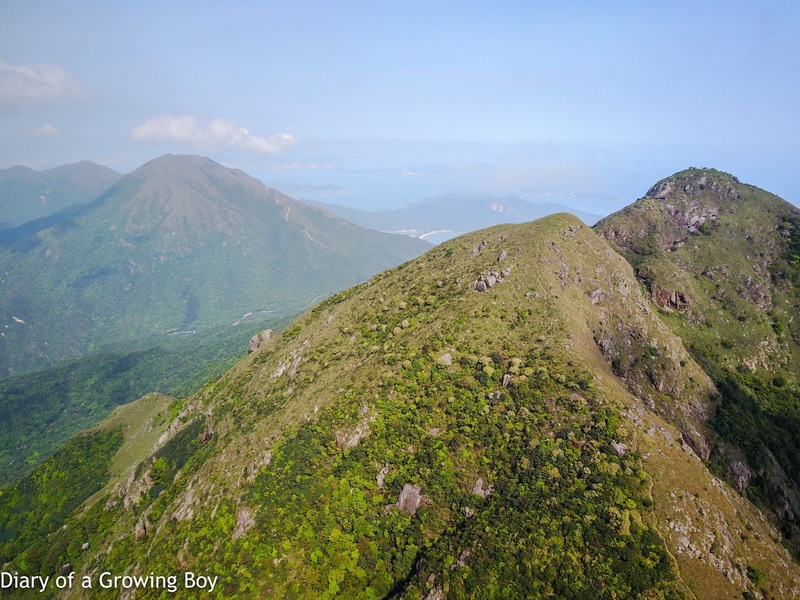 But Lantau Peak has an official height of 934m above sea level, and my Mavic Pro has an internal height limit of 500m. So even though I've kinda reached the top of the mountain, I couldn't gain enough height above it for a really good top-down shot. I was a little frustrated, but decided to descend and fly towards Kau Nga Ling. I didn't quite make it there, because battery concerns led me to recall the drone. Not wanting to bore my two companions further, I packed it up and moved us to our next hiking trail. 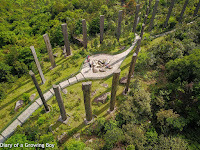 Nei Lak Shan Country Trail (彌勒山郊野徑) starts around where we were, and circles Nei Lak Shan (彌勒山). Heading north in a counter-clockwise direction, this would give us good views of the north side of Lantau Island, including the airport and nearby Tung Chung. We also get a pretty good view of the northern face of Lantau Peak. We were about halfway to my intended destination along this relatively deserted trail, when suddenly Hello Kitty - who was a few steps in front of me - jumped and screamed "SNAKE!" The remaining two of us reacted in shock, too, as I saw a pretty sizable black/dark gray snake - probably between 1 to 1.5m long - quickly dash into the bushes next to the trail. The snake was just as startled as we were, and thankfully none of us were hurt. In all these years of being on hiking trails I had always wondered if I would come across a live snake, and I never have - until today. We decided that it was probably a good idea to turn back and head home. 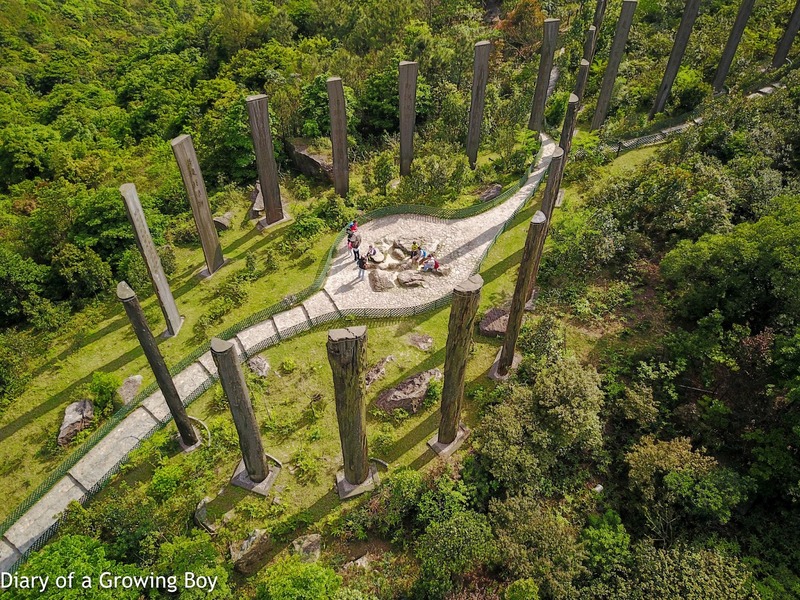 We'd had enough adventure for one day, and I thought I'd gotten some pretty good drone footage. 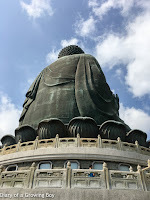 We took the bus back from Ngong Ping to Mui Wo, and caught the slow boat back to Central. The sun was going down, and we enjoyed looking at the sky being painted in beautiful colors. P.S. on our way back, we joked about the fact that the snake seemed as scared of us as we were of it. Well... if the snake were smart, it would certainly run away from people in Hong Kong... especially three who really enjoy their snake soup in the winter!